I’ve been on holiday this week and my best intentions of doing a second (and better) post this week as well as making some progress on the RESP book 2nd edition were thwarted by an illness. Oh well. I’m feeling better now and the holiday is not over, so hopefully I can salvage something. I was quoted in the latest MoneySense edition in the “Ask MoneySense” section. 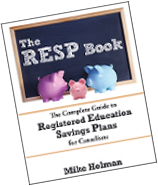 The question had to do with where to put RESP over-contributions – into the RESP or a TFSA? It’s a great issue with lots of good retirement scenarios, so I would suggest picking it up. My University Money reviews the Wealthy Barber. I read this book ages ago and thought it was good as well. I talked on the phone with Mr. Chilton a while ago and he’s a pretty good guy. Boomer and Echo interviewed the author of “The Big Cook“. The idea is to do batch cooking once a month or less. Sounds good to me! Head over to the post for a chance to enter in the contest. Michael James has an interesting retirement living strategy that his wife is not so keen on. Million Dollar Journey had enough of his Rogers cell phone. Canadian Capitalist reports that TD Waterhouse is not allowing any asset swaps in RRSP accounts, even though most are still legal. I don’t blame TD for doing this, although they should be honest about why they are discontinuing swaps. Congrats on the MoneySense quote! Maybe with the Canada Post strike over I can finally track down my magazine subscriptions from 1 of the 3 mail boxes (old house, rental, new house) and check it out. Thanks for the mention Mike. I can’t wait for Chilton’s take on the new financial picture in the book he is coming out with this fall. I’ve already bugged him for a review copy! I remember way back when my first full-time employer’s policy was that if you got sick or injured while on vacation and would not have been able to work, you got your vacation time back to use another time. I think those days are long gone for the private sector. Figures that a bank might not be completely forthcoming with their intentions. Belated thanks for the mention Mike. I saw your quote in MoneySense. Congratulations! Next post: Camping With Young Kids – Frugal Folly?